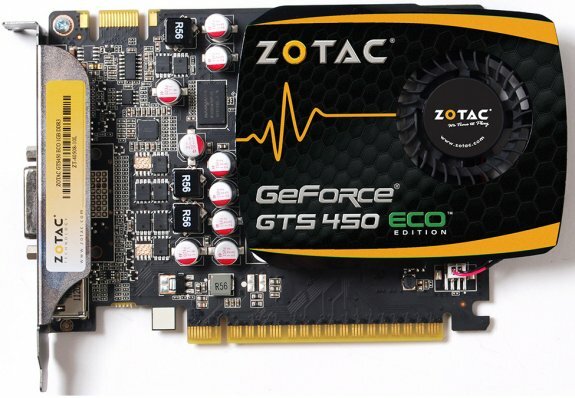 ZOTAC® International, a leading innovator and the world’s largest channel manufacturer of graphics cards, motherboards and mini-PCs, today debuts the new GeForce® GTS 450 ECO Edition with enhanced energy-efficiency. The new ZOTAC® GeForce® GTS 450 ECO Edition delivers best-in-class energy efficiency with a 33-percent reduction in energy consumption. The ZOTAC® GeForce® GTS 450 ECO Edition is the perfect graphics card for home theatre aficionados with superior home theatre-friendly features including hardware video decode acceleration for high-definition Blu-ray and Adobe® Flash® HD content, audio bitstreaming of Dolby® TrueHD and DTS-HD™ Master Audio. NVIDIA® 3D Vision™ readiness enables the ZOTAC® GeForce® GTS 450 ECO Edition to output Blu-ray 3D content via HDMI 1.4a for stunning 3D video playback. It’s time to play with the ZOTAC® GeForce® GTS 450 ECO Edition.